If your car or truck needs any warranty work, simply bring it in and we will take care of you. No strings attached. We know that finding a good, honest and fair company to do business with is very important these days. We are confident once you see how thorough we are and how concerned we are that the job gets done right, you are going to use the Southgate Top Value Car and Truck Service Center all the time. We offer complete service and repair for passenger cars, trucks, vans, RV's, commercial/fleet cars, trucks and vans. Our policy at Top Value is that we will honor ALL of our competitor's warranties. Even if they have moved or gone out of business. Your time is valuable, that's why we offer Same Day Service on most repairs, a comfortable waiting room in our Southgate shop (coffee on us!) and an off-hours drop box, which allows you to drop your vehicle off 24 hours a day. We accept checks, all major credit cards, and corporate/fleet charge accounts. Please call us or just stop by. 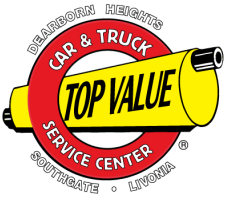 Visit us in this Southgate location, Dearborn Heights, Livonia, or any one of our other convenient auto repair and brake shops in Michigan and Ohio.